Today, I will show you why that happens and a few simple ways to take back control. I was on a sales call the other day and I know it went pretty good. I know, of course, there are areas in the call that I could have changed, slowed down, timed differently, etc. But overall, it went well. Then when discussing it with someone else, I explained it went a bit better than it did. I’m sure the more I talk about it, it will become the best call I ever did in my life – complete with drama, intrigue, and danger! Then when I go back to listen to the call, it will be just pretty good. Maybe a bit better than that. Or what about on social media where we have this over-inflated sense of self and often we believe our own hype? As I’ve been working with my teams these past few weeks, I noticed some trends and some major ah-ha moments in how they learn. And also how I learn too. To learn anything faster has to first start with being able to observe yourself and understand what you’re missing. Overestimating your own abilities is called the “above-average effect” and it’s very common in our day to day lives. I’ve mentioned a wonderful book called Subliminal: How Your Unconscious Mind Rules Your Behavior by Leonard Mlodinow where he looks at all the wild and weird things that happen behind the scenes in our brains. In various studies, they found that it’s a totally normal occurrence for us to simply think we are better than we are. In a study of about one million high school seniors, they were asked to judge their ability to get along with others. 100 percent rated themselves at least average, 60 percent rated themselves in the top 10 percent, and 25 percent considered themselves in the top 1 percent. And when asked about their leadership skills, only 2 percent assessed themselves as below average. This happens in nearly every profession as well. Another study found that physicians who diagnosed their patients as having pneumonia reported an average of 88 percent confidence in that diagnosis but proved correct only 20 percent of the time. It’s this overconfidence that can get you into trouble and even though you know on an intellectual level what is right, often your brain thinks otherwise. The funny part about what Mlodinow writes is that we have an ironic tendency to recognize this over-inflated self-assessment and overconfidence and understand that it’s a problem – but only in others. It boils down to the fact that our ego fights extremely hard to defend our honor and will do everything it can to keep us feeling powerful. So it’s good and bad at the same time. We even overestimate our ability to resist overestimating our abilities! So why are we so often misguided in our self awareness? As part of our quest to learn anything faster, let’s talk about two forces at work in our brain and how to take back control. Psychologist Jonathan Haidt explains that there are two ways to approach the truth: the way of the scientist and the way of the lawyer. As a scientist, you work to gather evidence, seek out irregularities, and create theories around your observations. Then you work on testing those theories to make sure they’re right and constantly work on improving them. The lawyer, on the other hand, begins with a conclusion they want to convince others of and then seeks out evidence to support it, while working hard to discredit anything that doesn’t. Now, neither one is wrong, but you must be aware that this is happening all the time. Your mind is a pretty good scientist, but an absolutely fantastic lawyer. We often tend to believe our own BS because it makes us feel good and it reinforces positive thoughts. No one consciously seeks to find the truth in themselves because it can be uncomfortable. But at the same time, if you were to just believe all the stats and facts, you may not take risks and go after your goals. 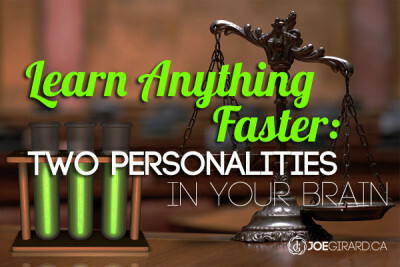 So we want to embrace our inner scientist and lawyers and help them become better partners in our success. there are two ways to approach the truth: the way of the scientist and the way of the lawyer. Psychologists call this inner advocate thinking “motivated reasoning.” And what’s amazing is that brain imaging studies are now showing that we’re creating these unconscious biases when making decisions. Read more on how we make decisions based on emotions in my four part series. When our brains assess emotionally relevant information, our brain automatically includes our wants, dreams, and desires. We may think that we make rational decisions and are strictly intellectual creatures, but these scans show otherwise. Mlodinow shares that these scans and studies show there is a physical mechanism for how our brains deceive us. When you help others take action on something, it has to be exciting AND believable to be effective. Now you have a strong understanding of the forces at play in your mind and in the minds of others. So how can you retrain yourself to accelerate learning and growth? Become better scientists. Be okay with taking the time to look at the truth of everything you do. I constantly work on building frameworks into all of my activities and for my teams. When you have the right steps to a process and areas you can zero-in on, you then have something to test and you can be much more creative within a framework. For example, I use a three part conversation in all of my sales calls which allows me to decrease the mental activity and be more present and authentic. Don’t simply do the same stuff over and over without testing and learning. Remember these words: Based on What? Be willing to get uncomfortable – for yourself and others. This week I did an exercise with a client and I worked with two of their reps. These wonderful ladies were willing to listen to their recorded calls together with me. We spend about 30 minutes dissecting each of the five minute calls and hearing the subtle nuances, energy levels, missed opportunities, and conversational pivots. Some things went well, and somethings…not so much. It’s uncomfortable judging yourself and being judged objectively. One of them actually felt bad for the person on the other end of the phone when she listened to some things she said. We had to bring that back to remember that they are both really nice, well intentioned people, who only want to serve their customers. And that their willingness to do this uncomfortable work is the true testament to their commitment to the people who they speak to. To help their customers really create change, they do this tough work on themselves. They are what I call real “Sales Heroes” so kudos to them and to anyone who takes this service approach. Record yourself. Like I said at the beginning of this post, as soon as we are off these calls or out of our meetings, it’s easy to think it went better than it did. On my smart phone I have this great app called ACR that I can switch on or off and it records my calls. I then go back and listen to them and look for all the subtleties. When did the conversation move from emotion to logic? Did I miss an opportunity to ask a question? Did I interrupt? Did I do too many likes and ums? Was my authenticity instantly on? Even if you just use the recorder on your smart phone and practice speaking, you will quickly see the gaps between what you sound like and what you think you sound like. When I rate calls, I give them a salesy weirdness factor which is the gap between your normal personality and the one that you present as. Don’t be weird. Create constant feedback loops. For everything you do, make sure that you have a way of tracking, measuring, and improving. If you want to get better at this stuff and really learn anything faster, then grab a piece of paper and rate yourself in different areas. Simply spot the times you are a scientist or a lawyer. Give yourself a weirdness rating. All you need to do is pay attention. Then, pick one thing to work on at a time. Recently I partnered up with a wonderful company called Enrollment Resources whose mission is to “pursue the truth” and we’ve been working with Admissions reps all over North America. It’s so much fun to be able to find those small process improvements, shift mindsets, and help these teams take back control of their days. It’s refreshing to be able to say, “hmmm, I’m not sure…let’s find out together.” To take the scientific approach to what has always been a lawyer-type of mindset. And as a consultant and trainer it is great to not push only my ideas on others but to solve problems collaboratively. If you are a rep and you are feeling overwhelmed, then this post should help you get some clarity and give you back control of your days. These are exactly the kinds of projects I am looking for! To learn anything faster requires you to stop doing what you have always done and be 100% honest with yourself first. Then the real fun begins! Remember to like and share this post and comment below on how you are willing to get uncomfortable to serve others.